So, on to your comments from the week. greentrams • Is it just me or does it look like results appear like someone took a dump in your cup? A pumpkin colored dump? Not appealing. It looks like a stool sample for a patient trying to beef up the old vitamin c.
Daniela Rossi • Is the exact orangey color the poop gets when you have to take vaseline to empty your guts for a test. A medical test, not a school one. That would be weird. I feel sorry for you guys, having to take vitamin C and Vaseline and stuff. That ain’t right. Alie • Hmm, don’t know about the vaseline thing, but it reminded me of baby poop. That’s exactly what my son’s poop looked like after he had sweet potatoes for the 1st time. Ok, so the consensus is poop. Noted. Trystan Terrell • I’m trying to imagine what tequila and chocolate would taste like mixed together. The closest I can come up with is vomiting after a night of margaritas and leftover halloween candy. Blech! Yep, poop and vomit. We keep it classy up in here. Uhoh. I may have to start doing costumed guest appearances– which would mean beefing up my acting, costuming, make-up, and video editing skills quite dramatically. Thanks for the comments this week, guys! Muchly muchly appreciated, as always! Here's this week's round-up of awesomeness from the blog comments this week, plus a link to the Cheeseblarg's round-up of Christmas ornaments. OMG! 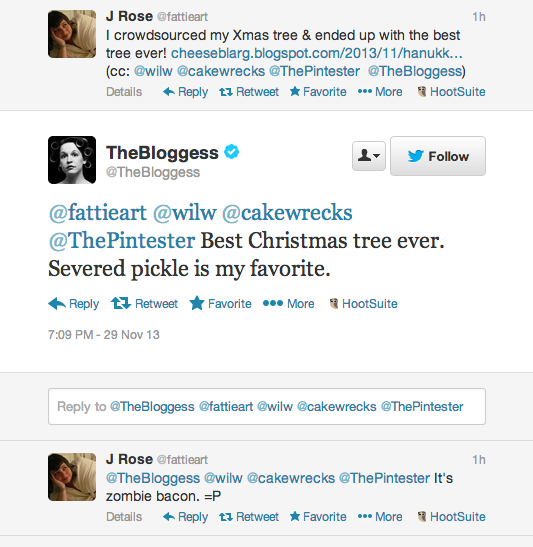 Asking the Bloggess hold twine for the Pintester would be so awesome! I really, really hope you do this.